Uric acid is commonly thought to be an inert waste product from purine metabolism. It is synthesized mainly in the liver, intestines, and other tissues such as muscles, kidneys, and the vascular endothelium as the end product of an exogenous pool of purines (derived largely from animal proteins), and the endogenous pool derived from live and dying cells degrading their nucleic acids, adenine, and guanine into uric acid. An elevated SUA is also one of the best independent predictors of diabetes and commonly precedes the development of both insulin resistance and type 2 diabetes, as noted in a meta-analysis of prospective cohort studies  and in a recent critical review. However, data regarding the prevalence of uric acid problems and its correlation with various anthropometric and metabolic parameters are scanty. In this background, we undertook this study in a rural population. A population-based observational study was undertaken to compare the parameters of metabolic health (anthropologic and biochemical) between tribal and non-tribal population in a rural area in the District of Birbhum, West Bengal, India, in collaboration with Palli Sangathan Bibhagh (PSV), Sriniketan, Visva-Bharati. The results presented herein are part of the data collected in the aforementioned study. Clearance from the Institutional Ethics Committee was obtained, and the study was conducted in accordance with the guidelines of the Helsinki Declaration. We selected areas with high concentration of tribal population and continued consecutive sampling till 205 samples were collected from the tribal population though 200 samples were targeted initially. And a sample of 200 consecutive population from the same or neighborhood areas not belonging to the tribal population was also selected. Thus, 405 individuals including both the tribal and non-tribal population were included in the study to make it an appropriate representation of rural population of West Bengal. The sample size was chosen on the basis of available resources. A health camp was organized with prior information to all eligible healthy participants of the area within the age group of 18 to 60 years. The participants were explained about the study in the rural health camp. Individuals were included in the study only if they agreed to give informed written consent and did not have any evident, definite or documented chronic infective or inflammatory disorder. History of addiction, including tobacco and alcohol, was documented. Anthropometric data including height, weight, waist circumference, and hip circumference were measured by trained personnel obeying the standard procedure of measurement as described below. Blood pressure was measured using standard methods in right arm sitting posture by an aneroid manometer. Body mass index (BMI) was calculated by standard method. Height was measured (to ±0.1 cm) in all included patients at baseline using a wall-mounted stadiometer. Body weight was measured (to ±0.1 kg) with the individuals wearing light indoor clothing and without shoes, using an calibrated electronic scale. BMI was calculated as weight in kilograms divided by the square of height in meters (kg/m 2). Waist circumference was measured at the end of a gentle expiration midway between the lower rib margin and iliac crest, with the patient standing with feet 23-30 cm apart. Hip circumference was measured at the level of maximum extension of the buttocks, at the same level all around the body with feet together. Waist to hip ratio (WHR) was calculated as a measure of the truncal obesity. Blood samples were collected for biochemical tests in overnight fasting state in camps to which participants came in the early morning hours. Part of the sample was allowed to clot and serum was separated by centrifuging on site, and samples were immediately sent for biochemical examination at a NABL accredited laboratory (appropriately transported on dry ice) for measurement of fasting serum insulin, creatinine, lipid profile, uric acid, alanine transaminase (ALT), aspartate transaminase (AST), alkaline phosphatase, calcium, phosphate, iPTH, and 25-hydroxy vitamin D3. Rest of the blood sample collected were anticoagulated with EDTA for fasting blood sugar (FBS) and glycated hemoglobin (HbA1c). The samples were analyzed using standard laboratory procedure. Diabetes was defined as per the standard diagnostic criteria satisfying either FBS or HbA1c. The presence of MetS was ascertained using the consensus criteria by International Diabetes Federation (IDF) criteria along with American Heart Association (AHA) and National Heart, Lung, and Blood Institute (NHLBI). Lean MetS was defined as those having waist criteria below the region specific waist criteria (80 cm for females and 90 cm for males) and even then satisfying the definition of MetS as per the National Cholesterol Education Program (NCEP) ATP-III (Adult Treatment Panel) criteria (at least three criteria). Obese MetS was similarly defined as those having satisfied the MetS criteria as well satisfying the region specific waist circumference criteria as defined in the IDF criteria. All analyses were conducted using SPSS (2012, version 21.0.0.0). Continuous data are presented as the mean ± standard deviation (if normally distributed) or median (interquartile range, if skewed), and categorical variables are presented as proportions. Correlations were calculated by Pearson's correlation test for normally distributed data and by Spearman's correlation test for data that were not normally distributed. Comparison between multiple means was done by one-way analysis of variance (ANOVA). Post hoc analysis was done by Bonferroni method. Uric acid was measured by spectophotometric uricase methods (normal range = 2.6–6.0 mg/dl). Four hundred and five individuals were included in the study, of whom 205 persons (50.62%) were from tribal population in distant rural areas and 200 persons (49.38%) were from the non-tribal population from rural/semi-urban areas; of these 405 persons, 232 were females (57.28%) and 173 were males (42.72%) (range = 18-60 years). The mean (±SD) age was 38.5 years ± 11.74 years. The participants were evaluated for several anthropometric and biochemical parameters, and test of normality was applied to the data obtained. [Table 1] shows the baseline demographic variables for the parameters, which had normal distribution, and [Table 2] shows the variables for the parameters, which were not in normal distribution. The uric acid measured in the study had a mean 4.2 mg/dL (±1.35): for the male population = 4.9 mg/dL (±1.28) and female = 3.7 mg/dL (±1.14). Seventy people out of 405 (17.2%) had uric acid level of less than 3.0 mg/dL and 13 of 405 people (3.2%) found to have uric acid level of more than 7.0 mg/dL. And eight people out of 405 (2.0%) had hypouricemia (uric acid level of less than 2.0 mg/dL). The number of persons who were found to have Obese MetS (N = 75, 18.5%), Lean MetS (N = 38, 9.4%), and people who do not have either of the MetS criteria (N = 292, 72.1%). However, if we consider the lean MetS prevalence among the lean population, the prevalence increases to 12.8% (N = 296). [Table 3] shows the correlation of uric acid with various clinico-biochemical parameters which were normally distributed, and [Table 4] shows the correlation of uric acid with various other clinico-biochemical parameters which were not normally distributed. 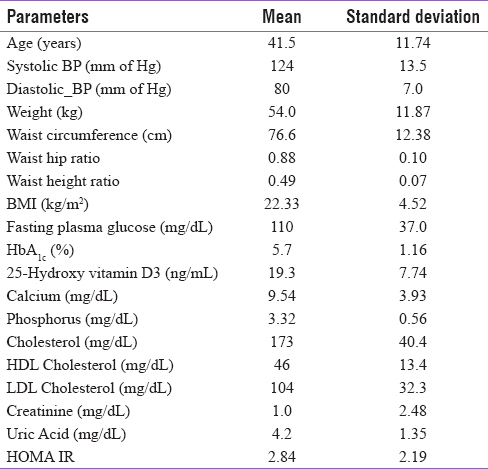 The SUA showed correlation with age, blood pressure (systolic and diastolic), and the anthropometric parameters for obesity, for example, weight, BMI, waist circumference, waist hip ratio, waist height ratio, and the surrogate of insulin resistance, namely, fasting insulin and HOMA-IR; it did not show any correlation with other parameters commonly associated with obesity, for example, fasting plasma glucose and 25-hydroxy vitamin D3 level. However, glycated Hb and lipid parameters, for example, total cholesterol, high-density lipoprotein (HDL)-cholesterol and low-density lipoprotein (LDL)-cholesterol, and triglycerides, were found to be correlated with SUA. The parameters associated with calcium homeostasis, for example, serum calcium, phosphate, 25-hydroxy vitamin D3, and iPTH level, did not correlate with SUA. [Table 5] shows difference of SUA level between normal or Non MetS population and MetS population, which is significant (4.1+ 1.29 vs. 4.7+1.42). Hence SUA is significantly higher in presence of MetS. 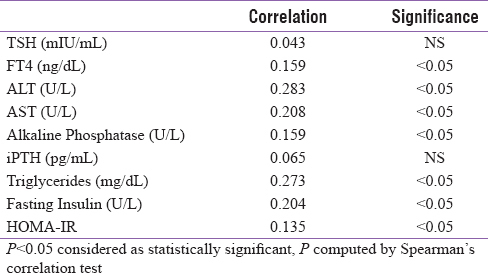 [Table 6] shows the correlation of uric acid level with various categories of MetS as defined earlier for the parameters, which were normally distributed. SUA has been correlated well with most of the parameters associated with obesity in this study. In addition, the SUA has also been correlated with components of MetS. However, the SUA was not significantly different between Non-MetS and Lean MetS (P = 0.44). And the uric acid level was also not significantly different between groups of Obese MetS and Lean MetS (P = 0.50). Nonetheless, the uric acid level was found to be significantly different between Non-MetS and Obese MetS (P < 0.0005). This probably signifies that the overall adiposity as is reflected in the BMI is more important than in relation to the SUA rather than the MetS itself as defined by the current NCEP-III criteria. Hyperuricemia is both causative and protective in disease. The causative link between hyperuricemia and disease is clearest for gout, and associations have been documented for some other comorbidities, for example, hypertension, chronic kidney disease, and diabetes. Hyperuricemia has a dramatically different, protective effect in neurodegenerative disease, including Parkinson's disease, multiple sclerosis, and Alzheimer's disease/dementia. Vitamin D deficiency, a major public health problem worldwide, is associated with hyperuricemia but casual association is questionable. Moreover, clinical studies have uncovered a significant association between parathyroid hormone (PTH) and uric acid level in humans. Hyperuricemia has been found in patients suffering from hyperparathyroidism., It is conceivable that vitamin D deficiency leading to secondary hyperparathyroidism may have a contributory role in elevation of SUA. In fact, some study had suggested that the role of uric acid–induced inflammation might be mediated by the elevated PTH associated with low vitamin D. In our study, while the mean 25-hydroxy vitamin D3 was found to be low with slightly elevated iPTH level, however, no association of SUA with the two parameters have been found. Overt and subclinical hypothyroidism has been found to be associated with elevated SUA. The hyperuricemia was attributed to decreased renal plasma flow and impaired glomerular filtration. We have included the estimation of Free T4 and thyroid-stimulating hormone (TSH) measurement to rule out thyroid disease as an important and common confounding agent. The data from our study showed that while there is a correlation of SUA with Free T4 level, the correlation is lacking with the TSH level. This observation of association of Free T4 with SUA in an euthyroid population has been documented earlier in another study. SUA has been found to be associated with serum triglycerides in a number of studies on healthy participants.,, And in those studies, it has been observed that SUA also had association with hypertension, insulin resistance, and so on and there is a clustering of risk factors as SUA increases, suggesting probably the emergence of MetS. In a small number of studies, however, there has been an association additionally with LDL-cholesterol and a negative association with HDL-cholesterol. In our study, we found a positive association with triglycerides and LDL-cholesterol and a negative one with HDL-cholesterol. SUA has been found to be associated with altered liver function test, especially elevated ALT. In our study, SUA is correlated with both AST and ALT. In fact, in anotherstudy, hyperuricemia has been found to be independently associated with hepatic steatosis regardless of BMI category or the presence of the MetS. SUA is intimately associated with obesity in many populations of young and the old, and reduction of weight leads to reduced SUA. In another study done on identical twins to nullify the contribution of the genetic factors, SUA was found to be significantly associated with BMI even after adjusting for genetic and family environment factors in both men and women. In one particular study on healthy schoolchildren, waist circumference correlated better with uric acid levels than BMI, which was also noted in our study. In our study, it was noted that SUA was correlated with components of MetS. However, the SUA was not significantly different between Non-MetS and Lean MetS (P = 0.44). And the uric acid level was also not significantly different between groups of Obese MetS and Lean MetS (P = 0.50). Nonetheless, the uric acid level was found to be significantly different between Non-MetS and Obese MetS (P < 0.0005). 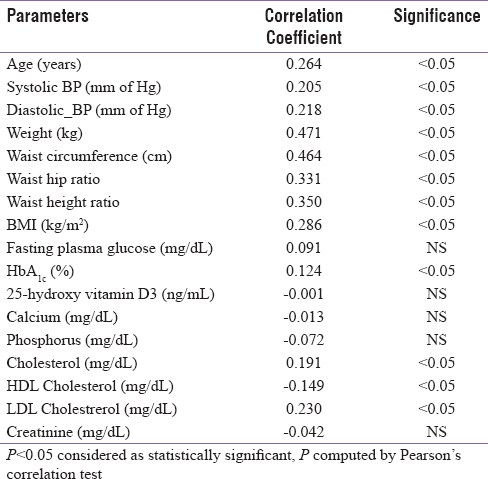 This study done in rural middle aged population showed moderate degree of correlation of statistical significance with many anthropometric parameters. SUA is elevated in MetS compared to the normal population. However, SUA in Lean MetS is not different from Obese MetS. We gratefully acknowledge the fund received from The Department of Science and Technology, Govt. of West Bengal, India, for this study. Garrod AB. Observations on certain pathological conditions of the blood and urine, in gout, rheumatism, and Bright's disease. Med Chir Trans 1848;31:83-97. Davis NS Jr. The cardio-vascular and renal relations and manifestations of gout. JAMA 1897;29:261-2. Mazzali M, Kanbay M, Segal MS, Shafiu M, Jalal D, Feig DI, et al. Uric acid and hypertension: Cause or effect? Curr Rheumatol Rep 2010;12:108-17. Kanbay M, Segal M, Afsar B, Kang DH, Rodriguez-Iturbe B, Johnson RJ. The role of uric acid in the pathogenesis of human cardiovascular disease. Heart 2013;99:759-66. Yu MA, Sánchez-Lozada LG, Johnson RJ, Kang DH. Oxidative stress with an activation of the renin-angiotensin system in human vascular endothelial cells as a novel mechanism of uric acid-induced endothelial dysfunction. J Hypertens 2010;28:1234-42. Park JH, Jin YM, Hwang S, Cho DH, Kang DH, Jo I. Uric acid attenuates nitric oxide production by decreasing the interaction between endothelial nitric oxide synthase and calmodulin in human umbilical vein endothelial cells: A mechanism for uric acid-induced cardiovascular disease development. Nitric oxide 2013;32:36-42. Li P, Zhang L, Zhang M, Zhou C, Lin N. Uric acid enhances PKC-dependent eNOS phosphorylation and mediates cellular ER stress: A mechanism for uric acid-induced endothelial dysfunction. Int J Mol Med 2016;37:989-97. Lv Q, Meng XF, He FF, Chen S, Su H, Xiong J, et al. High serum uric acid and increased risk of type 2 diabetes: A systemic review and meta-analysis of prospective cohort studies. PLoS One 2013;8:e56864. Johnson RJ, Merriman T, Lanaspa MA. Causal or noncausal relationship of uric acid with diabetes. Diabetes 2015;64:2720-2. Mukhopadhyay P, Ghosh S, Bhattacharjee K, Pandit K, Mukherjee PS, Chowdhury S. Lean metabolic syndrome: A concept or a reality? Indian J Endocr Metab 2018;22:303-7. Soltani Z, Rasheed K, Kapusta DR, Reisin E. Potential role of uric acid in metabolic syndrome, hypertension, kidney injury, and cardiovascular diseases: Is it time for reappraisal? Curr Hypertens Rep 2013;15:175-81. Li X, Meng X, Timofeeva M, Tzoulaki I, Tsilidis KK, Ioannidis JP, et al. Serum uric acid levels and multiple health outcomes: Umbrella review of evidence from observational studies, randomised controlled trials, and Mendelianrandomisation studies. BMJ 2017;357:j2376. Bombelli M, Quarti-Trevano F, Tadic M, Facchetti R, Cuspidi C, Mancia G, et al. Uric acid and risk of new-onset metabolic syndrome, impaired fasting glucose and diabetes mellitus in a general Italian population: Data from the Pressioni Arteriose Monitorate E Loro Associazioni study. J Hypertens 2018;36:1492-8. El Ridi R, Tallima H. Physiological functions and pathogenic potential of uric acid: A review. J Adv Res 2017;8:487-93. Chin KY, Nirwana SI, Ngah WZ. Significant association between parathyroid hormone and uric acid level in men. ClinInterv Aging 2015;10:1377-80. Thakkinstian A, Anothaisintawee T, Chailurkit L, Ratanachaiwong W, Yamwong S, Sritara P, et al. Potential causal associations between vitamin D and uric acid: Bidirectional mediation analysis. Sci Rep 2015;5:14528. Cartaya J, Gupta OT. Uric acid, parathyroid hormone, and vitamin D: New players in an old game. Metab Syndr Relat Disord 2016;14:135-6. Giordano N, Santacroce C, Mattii G, Geraci S, Amendola A, Gennari C. Hyperuricemia and gout in thyroid endocrine disorders. Clin Exp Rheumatol 2001;19:661-5. Ye Y, Gai X, Xie H, Jiao L, Zhang S. Association between serum free thyroxine (FT4) and uric acid levels in populations without overt thyroid dysfunction. Ann Clin Lab Sci 2015;45:49-53. Ferreira TDS, Fernandes JFR, Araújo LDS, Nogueira LP, Leal PM, Antunes VP, et al. Serum uric acid levels are associated with cardiometabolic risk factors in healthy young and middle-aged adults. Arq Bras Cardiol 2018;111:833-40. Kuwabara M, Borghi C, Cicero AFG, Hisatome I, Niwa K, Ohno M, et al. Elevated serum uric acid increases risks for developing high LDL cholesterol and hypertriglyceridemia: A five-year cohort study in Japan. Int J Cardiol 2018;261:183-8. Jayashankar CA, Andrews HP, Vijayasarathi, Pinnelli VB, Shashidharan B, Nithin Kumar HN, et al. Serum uric acid and low-density lipoprotein cholesterol levels are independent predictors of coronary artery disease in Asian Indian patients with type 2 diabetes mellitus. J Nat Sci Biol Med 2016;7:161-5. Hsieh MH, Lin WY, Chien HH, Chien LH, Huang CK, Yang JF, et al. Waist circumference, body mass index, serum uric acid, blood sugar, and triglyceride levels are important risk factors for abnormal liver function tests in the Taiwanese population. Kaohsiung J Med Sci 2012;28:470-6. Lurbe E, Torro MI, Alvarez-Pitti J, Redon J, Borghi C, Redon P. Uric acid is linked to cardiometabolic risk factors in overweight and obese youths. J Hypertens 2018;36:1840-6. Zhou J, Wang Y, Lian F, Chen D, Qiu Q, Xu H, et al. Physical exercises and weight loss in obese patients help to improve uric acid. Oncotarget 2017;8:94893-9. Tanaka K, Ogata S, Tanaka H, Omura K, Honda C, Hayakawa K, et al. Osaka Twin Research Group. The relationship between body mass index and uric acid: A study on Japanese adult twins. Environ Health Prev Med 2015;20:347-53. Hirschler V, Esteban M, González C, Molinari C, Castano L. Association between waist circumference and magnesium and uric acid in indigenous argentinean children living at high altitude. Cardiovasc Hematol Agents Med Chem 2016;14:134-40.